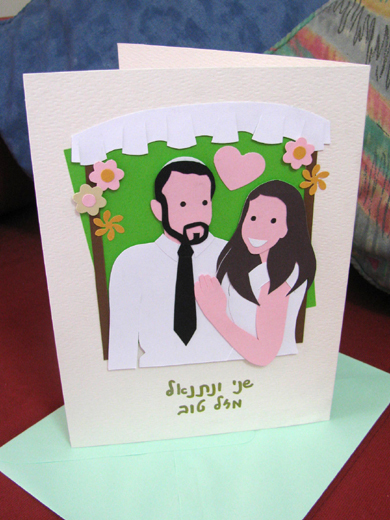 Some time ago a customer asked me to make two wedding cards. The cards I created show each bride and groom under the chuppah, the canopy under which a Jewish couple stand during their wedding ceremony. I decorated the chuppah with a few flowers, as they are often decorated, and added a big pink heart to both cards. The cards open in the Hebrew direction, from the right, because the Hebrew language is read from right to left instead of left to right like English. The Hebrew greeting says "Mazal Tov Shani and Nathaniel" and "Mazal Tov Sarah and Arnon" respectively. It seems that Sarah, above, was particularly happy to receive her customised card. "Thank you so much! It is so beautiful. Amazing." she wrote to my customer. The same customer also asked me to make a 25th wedding anniversary card for her husband. She asked me to personalise it by adding pictures of their kids and pets, and to also include an Australian flag and an Israeli flag. I added the big 25 years in silver numbers and letters, since the 25th wedding anniversary is the silver anniversary. Her husband loved the card and thought it was amazing how much the kids look like them! * This post has been shared on All Seasons, Creative Mondays, Happiness is Homemade, Amaze Me Monday, Inspiration Monday, MMM Block Party, Busy Monday, The Good. The Random. 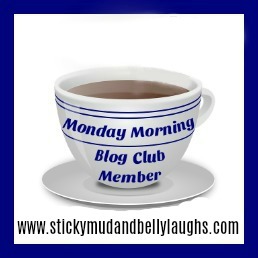 The Fun., Make It Pretty Monday and Wordless Wednesday (on Tuesday). Love the hair over the shoulder! beautiful cards as usual, you have a very definite style. I love how you please all your customers so much. The wedding and anniversary cards are so beautiful and fun (a great compliment when a parent says it it so much looks like their kids!!). Hubby told me about the chuppah because once he was in a Jewish wedding - a beautiful symbol! Thank you for sharing these lovely cards for All Seasons, Lisa! Marvelous - you have such talent!